The cruise control main switch is used to turn the dynamic radar cruise control system on and off, as well as operate 7 functions: SET, - (COAST), TAP-DOWN, RES (RESUME), + (ACCEL), TAP-UP and CANCEL. The SET, TAP-DOWN, and - (COAST) functions, and the RES (RESUME), TAP-UP, and + (ACCEL) functions are operated with the same switch. The cruise control main switch is an automatic return type switch which turns on only while operating it in the direction of each arrow and turns off after releasing it. Vehicle-to-vehicle distance control mode is selected by default when the dynamic radar cruise control system is turned on using the cruise control main switch (ON-OFF button). Operation of constant speed control mode is the same as that for a conventional cruise control system. (a) This system maintains the vehicle at the speed that the driver has set, as long as there are no vehicles ahead. 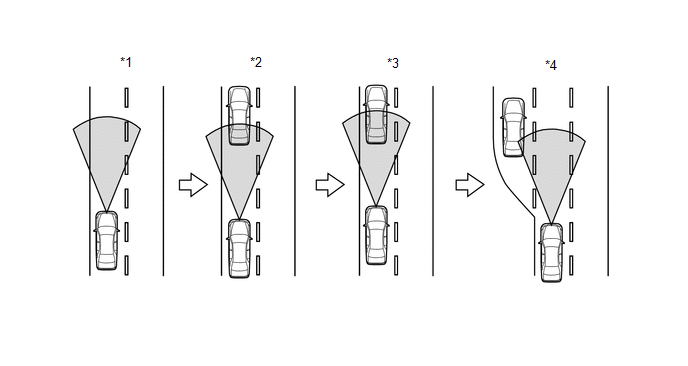 In addition to this, the system maintains the vehicle-to-vehicle distance that has been set by the driver. If the system detects a vehicle driving at a slower speed ahead while the driver is driving at a constant speed, it controls the engine to decelerate the vehicle. If further deceleration is required, the system controls the brake actuator assembly in order to apply the brakes. Thereafter, if there are no vehicles ahead within the set vehicle-to-vehicle distance because either the vehicle ahead or the driver has changed lanes, the system accelerates slowly to reach the set speed and resumes driving at this speed. (b) Vehicle-to-vehicle distance control mode is designed to control vehicle speed and vehicle-to-vehicle distance using the constant speed function, deceleration cruising function, follow-up cruising function, and acceleration cruising function. (c) The millimeter wave radar sensor assembly and forward recognition camera control the system while vehicle-to-vehicle distance control mode is operating, and send signals to each actuator and ECU. (d) In vehicle-to-vehicle distance control mode, the dynamic radar cruise control system receives signals from the forward recognition camera, yaw rate sensor (airbag sensor assembly) and the steering angle sensor. Based on these signals, the system then estimates curve radius and compensates for information on the preceding vehicle while turning. It can also compensate using brake control when approaching another vehicle. (e) This system judges the presence of a vehicle in front and the distance to it based on the signals from the millimeter wave radar sensor assembly and forward recognition camera while vehicle-to-vehicle distance control mode is operating. Using this information, the system informs the driver of danger with the warning buzzer, performs brake control, and turns on the stop lights when approaching a vehicle in front. (f) The dynamic radar cruise control system performs the following controls (example). Vehicle distance increases and decreases in accordance with vehicle speed. Control conditions are indicated on the multi-information display in the combination meter assembly. *: Throttle valve control and brake control are performed to decelerate the vehicle. If deceleration is insufficient and the distance to the preceding vehicle becomes too short, the vehicle approach warning buzzer sounds to warn the driver to take an appropriate action (braking, etc.). Illuminates based on signals from the ECM when the dynamic radar cruise control system is turned on using the cruise control main switch (ON-OFF button). Turns off based on signals from the ECM or millimeter wave radar sensor assembly when a malfunction is detected in the dynamic radar cruise control system. Illuminates when the dynamic radar cruise control system is turned on using the cruise control main switch (ON-OFF button) and constant speed control mode is selected. Illuminates when the vehicle speed is set. Displays dynamic radar cruise control system information based on signals from the ECM when the dynamic radar cruise control system is turned on using the cruise control main switch (ON-OFF button). Displays a warning message if the ECM or millimeter wave radar sensor assembly detects a malfunction signal while the dynamic radar cruise control system is controlling vehicle speed. Sounds once to inform the driver if the ECM or millimeter wave radar sensor assembly detects an automatic cancel signal while the dynamic radar cruise control system is controlling vehicle speed. Turns the dynamic radar cruise control system on and off. Switches the control mode between constant speed control mode and vehicle-to-vehicle distance control mode. A cancel signal is sent to the ECM when the switch is operated. Acceleration and stored speed resume signals are sent to the ECM when the switch is operated. Deceleration and vehicle speed setting signals are sent to the ECM when the switch is operated. When vehicle-to-vehicle distance control mode is controlling vehicle speed, the driver can operate the switch to select the vehicle-to-vehicle distance in 3 stages: long, middle, and short. Outputs brake pedal depression signals to the ECM. Captures the image in front of the vehicle to detect lane markers and objects on the road ahead. Outputs steering angle signals to the millimeter wave radar sensor assembly. Outputs wheel speed signals to the skid control ECU. Outputs yaw rate signals to the millimeter wave radar sensor assembly. Operates the brake actuator assembly in accordance with brake request signals received from the ECM when the dynamic radar cruise control system is in vehicle-to-vehicle distance control mode. Actuates the brakes in accordance with signals from the skid control ECU. While the dynamic radar cruise control system is in vehicle-to-vehicle distance control mode, the skid control ECU actuates the hydraulic brake booster in accordance with a brake request signal received from the ECM. Sounds upon receiving signals from the forward recognition camera. Controls the dynamic radar cruise control system in accordance with signals received from switches, sensors, and the millimeter wave radar sensor assembly. Stores DTCs if a malfunction is detected in the dynamic radar cruise control system. Adjusts the throttle valve opening angle in accordance with signals received from the ECM. Outputs the throttle valve opening angle to the ECM. Detects a preceding vehicle based on signals from the millimeter wave radar sensor assembly when the dynamic radar cruise control system is in vehicle-to-vehicle distance control mode. Then, the millimeter wave radar sensor assembly calculates the acceleration or deceleration required to achieve the target vehicle-to-vehicle distance, and outputs request signals to the ECM. Sends information such as vehicle-to-vehicle distance, relative speed and presence of a vehicle in front to the ECM based on reflected millimeter waves. Outputs the shift lever position to the ECM. Detects the depressing of the clutch pedal and transmits the signal to the ECM. Detects the neutral position and transmits the signal to the ECM. Outputs VSC off signals to the skid control ECU. While the vehicle is being driven in S mode, outputs "+" (upshift) or "-" (downshift) request signals to the ECM. The lowest possible set speed for the dynamic radar cruise control system (constant speed control mode) is approximately 40 km/h (25 mph). In vehicle-to-vehicle distance control mode, the system detects a preceding vehicle and maintains an appropriate vehicle-to-vehicle distance according to the speed of the preceding vehicle (follow-up control). The driver can operate the vehicle-to-vehicle distance control switch (steering pad switch assembly) to select the vehicle-to-vehicle distance in 3 levels: long, middle, or short. The mode performs 4 controls: constant speed control, deceleration control, follow-up control, and acceleration control. The vehicle speed is stored and control of vehicle speed begins when the cruise control main switch is pushed to -SET while driving at a speed of between approximately 50 km/h (30 mph) and 180 km/h (110 mph) with the dynamic radar cruise control system on. When the set speed is stored, the cruise control SET indicator illuminates and the set speed is displayed on the multi-information display. The low speed limit is approximately 40 km/h (25 mph). If the vehicle speed drops below the low speed limit, speed control by the dynamic radar cruise control system is canceled automatically and the set vehicle speed is kept in memory. The highest possible set speed is approximately 180 km/h (110 mph). The dynamic radar cruise control system cannot be set when the vehicle speed is over the high speed limit. Also, + (ACCEL)/RES (RESUME) cannot be used to increase the speed beyond the high speed limit. The ECM compares the actual vehicle speed and the stored vehicle speed. When the vehicle speed is less than the stored vehicle speed, it increases the opening angle of the throttle valve. The vehicle follows the preceding vehicle while maintaining an appropriate vehicle-to-vehicle distance according to the speed of the preceding vehicle. When the cruise control main switch (ON-OFF button) is pushed and held for 1.5 seconds or more with the dynamic radar cruise control system off, mode changes to constant speed control mode. When vehicle-to-vehicle distance control mode is controlling vehicle speed and the +RES switch is pushed and held, the stored vehicle speed increases in increments of approximately 1 km/h or 1 mph* or 5 km/h or 5 mph. Pushing the +RES switch while following a preceding vehicle using vehicle-to-vehicle distance control mode does not increase actual vehicle speed, but changes only the stored vehicle speed. When vehicle-to-vehicle distance control mode is controlling vehicle speed and the cruise control main switch is tapped to the +RES side (for 0.6 seconds or less), the stored vehicle speed increases by approximately 1 km/h or 1 mph for each time the switch is tapped. When vehicle-to-vehicle distance control mode is controlling vehicle speed and the -SET switch is pushed and held, the stored vehicle speed decreases in increments of approximately 1 km/h or 1 mph* or 5 km/h or 5 mph. When vehicle-to-vehicle distance control mode is controlling vehicle speed and the cruise control main switch is tapped to -SET (for 0.6 seconds or less), the stored vehicle speed decreases by approximately 1 km/h or 1 mph for each time the switch is tapped. This system has an automatic cancellation function (fail-safe). Performing any of the following cancels dynamic radar cruise control system control of vehicle speed (the stored vehicle speed in the ECM is maintained). Turning the dynamic radar cruise control system off using the cruise control main switch (ON-OFF button) (the stored vehicle speed in the ECM is not maintained). Clutch pedal is depressed for a certain period of time or longer. Moving the shift lever to neutral and waiting for a certain amount of time. For details of other cancel controls, refer to the fail-safe chart. When the vehicle speed is between the low and high speed limits, pushing the cruise control switch to +RES resumes and maintains the stored vehicle speed from the time of cancellation. If the preceding vehicle moves out of the lane while follow-up control is operating, the vehicle speed is gradually increased to the set vehicle speed. At this time, the vehicle speed can be increased by pushing the cruise control main switch to +RES. When driving on an uphill with the dynamic radar cruise control system controlling vehicle speed, the transmission may downshift from an overdrive gear. After the downshift, if the system determines that the uphill inclination has become smaller based on the throttle valve opening angle, the transmission automatically returns to the overdrive gear. When a large amount of deceleration is required while vehicle-to vehicle distance control mode is controlling vehicle speed, the brake actuator assembly is operated to apply the brakes. The stop lights illuminate at this time. The vehicle speed is stored and control of vehicle speed begins when the cruise control main switch is pushed to -SET while driving at a speed of between approximately 40 km/h (25 mph) and 200 km/h (125 mph) with the dynamic radar cruise control system on. The lowest possible set speed is approximately 40 km/h (25 mph). The highest possible set speed is approximately 200 km/h (125 mph). The dynamic radar cruise control system cannot be set when the vehicle speed is over the high speed limit. Also, + (ACCEL)/RES (RESUME) cannot be used to increase the speed beyond the high speed limit. When the dynamic radar cruise control system is controlling vehicle speed and the cruise control main switch is pushed to +RES and held in that position, the dynamic radar cruise control system sends a signal to the ECM to operate the throttle valve motor of the throttle body with motor assembly to open the throttle valve. Following this, the vehicle speed is stored and maintained when the cruise control main switch is released. If the vehicle speed exceeds the high speed limit (approximately 200 km/h (125 mph)) while the cruise control main switch is in the +RES position, the highest possible set speed is stored. When the dynamic radar cruise control system is controlling vehicle speed and the cruise control main switch is tapped to +RES (for approximately 0.6 seconds), the stored vehicle speed increases by approximately 1 km/h or 1 mph for each time the switch is tapped. When the cruise control main switch is tapped to +RES and the difference between the current and stored vehicle speed is more than 5 km/h (3 mph), the stored vehicle speed will not be changed. When the dynamic radar cruise control system is controlling vehicle speed and the cruise control main switch is pushed to -SET and held in that position, the cruise control system sends a "throttle valve opening angle 0°" demand signal to the ECM. Following this, the vehicle speed is stored and maintained when the cruise control main switch is released. An actual throttle valve opening angle of 0° is not possible due to factors such as idle speed control. When the dynamic radar cruise control system is controlling vehicle speed and the cruise control main switch is tapped to -SET (for approximately 0.6 seconds), the stored vehicle speed decreases by approximately 1 km/h or 1 mph for each time the switch is tapped. When the cruise control main switch is tapped to -SET and the difference between the current and stored vehicle speed is more than 5 km/h (3 mph), the current vehicle speed is stored and speed control is performed. Performing any of the following cancels dynamic radar cruise control system control of vehicle speed. Pulling the cruise control main switch to CANCEL. Turning the cruise control system off using the cruise control main switch (ON-OFF button) (the stored vehicle speed in the ECM is not maintained). If control of vehicle speed by the dynamic radar cruise control system was canceled due to any of the manual cancel conditions (other than turning the dynamic radar cruise control system off using the cruise control main switch (ON-OFF button)), and if the vehicle speed is between the low and high speed limits, the stored vehicle speed from the time of cancellation will be resumed and maintained when the cruise control main switch is pushed to +RES.